With a mission to not just get patients healthy, but a passion to educate them along the way, Dr. Roddy (Chiropractor) combines his own love of learning with a multidisciplinary approach to chiropractic care for optimal patient health. Dr. Roddy (Chiropractor) has been in practice since 2006. He opened Croydon Sports Injury Clinic Ltd in 2010. Unlike others, he employs combination therapy for nearly all patients, understanding that to achieve the best results, a combination of physiotherapy techniques, massage, rehab and chiropractic care is often favorable. Having practiced around the world in both the United Kingdom and Australia, Dr. Roddy (Chiropractor) has a unique understanding of how to address your health concerns, bringing a worldly approach to modern wellness. 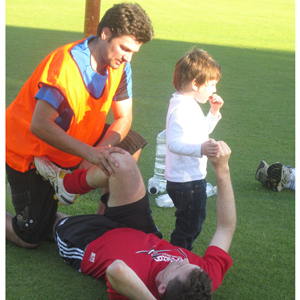 At Croydon Sports Injury Clinic Ltd, we welcome patients of all ages to try chiropractic care. In fact, we currently see patients between ages five and one hundred for a wide range of back and neck pain and sports injuries from everyday activities to sporting accidents and those who are healthy and wish to maintain their wellness. Unlike many practices, Croydon Sports Injury Clinic Ltd is pleased to be able to offer our patients flexible and emergency office hours with Dr. Roddy (Chiropractor) making himself available when you and your family needs it most. If you’re ready to learn more about the power of chiropractic care, we invite you to contact our practice today to schedule your appointment. We look forward to crafting a custom plan just for you to help bring you into health and out of pain. I have been seeing Dr Roddy for around a year now and I would 100% recommend him to anyone. He is extremely knowledgable and a miracle worker with his treatments. He is very thorough and provides fantastic relief from any symptons and follows up with suggested exercises to do at home. He is extremely trustworthy and great at what he does. After an emergency call to Dr. Knight (Chiropractor) for a lower back injury, I arrived at his clinic in severe discomfort. After just one session I was feeling myself again and a few follow up sessions to correct my posture was needed. I will definitely recommend Dr. Knight (Chiropractor). Great friendly service.